The Master List at Mind-Mapping.Org claims to have every concept mapping, mind mapping and related type of visual organizer there is (or was). Well, to be honest, new ones keep appearing and get added to the To Do list. But “every one there is” is the aim. At the time of writing, there are 402 entries: 296 being current software and 106 historical, making this the most comprehensive source on the Web by far. 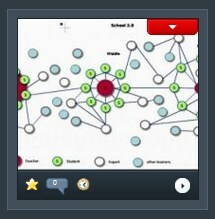 If you’re looking for a quick guide to what’s available, that’s a formidable list, so on August 2010, Vic founded a section of Mind-Mapping.Org for those looking for just the more popular mapping software. He named it Vic’s Picks but now Vic has moved on to other things, Roy decided to rename it as Top Picks. 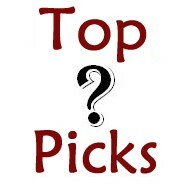 Top Picks is really two things: A place for readers to quickly find what’s significant, but more importantly, a place for crowdsourcing: Here you can mark your favourite software and comment about your own experience of it in use. On the Vic’s Picks pages you’ll see many entries like the illustration on the left. The red tab will let you see the name and a brief summary of the software for each entry. The arrow button at its bottom right will link to the Vic’s Pick entry for this. That in turn includes a link to the main article for the product in The Master List. You will be able to add your personal rating of the tool by clicking on the yellow ‘Favourite’ star. And you will be able to add comments about a specific package, if you wish, from the blue speech bubble on each entry on the Vic’s Picks pages. To see visual tools from one of the broad categories shown here, use the menu at the top of the page (here it’s just an image). For a narrower breakdown by tool type, Operating System (OS) or price, use the Categories selector in the right-hand column which is illustrated in the image here. In case you’re wondering, if you select, for example, Fishbone charts, you may not see entries that show images of Fishbone charts – the seletion just ensures that you can see entries for software that can produce those charts. That’s because each entry in Top Picks has only one image. More detail is available in the main entry that Top Picks links to. I came across what appears to be a new offering: http://www.mindmaple.com I’m new to this and looking for appropriate software more for project management and task management, brainstorming of tasks, etc. Mindjet’s software seems to be an overkill (and expensive). Interested in your take of mindmaple’s offering. MindMaple’s on my list to go into mind-mapping.org, but I haven’t got round to an evaluation of it yet. The first thing I spotted in its favour is that it lets you place nodes freely. Too many mind mapping programs want control over the layout of our maps! But before you pay $50 for software, I’d suggest you look at Xmind’s free version. It does a good job, is powerful, and lets you upload maps to their server for others to download. Thanks Vic. I am also trying out Xmind’s free version but the “cons” of this version for me is that I can’t enter in task information or export out to MSWord, etc., without paying for the Pro version. I’m not a fan of their subscription business model of having to login in order to obtain the Pro version (doesn’t work for me if I’m on an airplane trying to work or not on the Internet) – but I can be wrong about this. The one nice feature of Xmind is their drill down/up feature which MindMaple doesn’t have. The drag/drop capability of MindMaple to create child/sub topics is very intuitive. I don’t mind paying $50 (just not $250 or $399) but it’s a question of who will get my $50: XMind or MindMaple. Jury’s still out for me. Both free version and Pro version are desktop apps. You don’t have to be logged in to the online server to use them so you can use them wherever you are with your laptop. That puts the lid on using XMind’s sharing platform to collaborate. Well, you wouldn’t put confidential material there, it’s true. But not everything is sensitive. It’s like uploading to Biggerplate – you can publicise your mind maps if you want to, or not. Actually I’ve never known them take anything from their server to exploit, but I don’t load stuff up. And those terms are self-contradictory: by granting the rights they claim, the submitter’s rights to copyright protection are indeed diminished. Trying to locate a concept or mindmapping software for Windows that is at least two-point multi-touch. You might add touch-screen friendly as another category? At any rate, if you have a recommendation we might consider for a wall mounted HP TouchSmart 9300 with Win7, we’re looking for apps to consider in an educational environment. We found TouchMind but it doesn’t seem to actually work very well for us. Off the top of my head, I can’t think of one. I use iThoughtsHD on the iPad, but on Windows, the only pad-enabled mind mapper I know of is MindManager, but when I last used that on my antique and now non-functioning Toshiba Portege pad, it was only pen enabled. That was before multi-touch, anyway. I’ve put a question up on the Mindmappers’ Forum and I’ll mention it on Twitter. I see what you mean. It’s useful to have the view of someone who didn’t design it, thanks. The images in this particular post are there only to illustrate the text. I’ve uncoupled them from a link to the image and improved the text. How does it work for you now? Clicking on widgets gets me a picture of the widget … can’t figure out what your website is all about … When I click on select category, I get a new window with a picture of the widget rather than a drop down.